Perfect address labeller for the busy office. Providing unprecedented flexibility and creative possibilities for users, the Brother QL-800 Label Printer prints in both black and red text, enabling a variety of use applications including warnings, special identification of persons on name tags, highlighting important messages, emphasising offers on signs or for practical reminders. 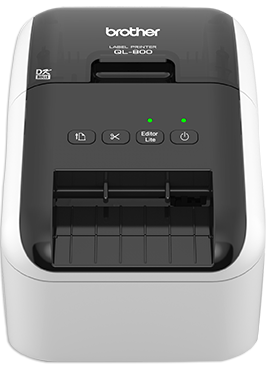 Offering USB connectivity, an integrated cutter and software for designing your own labels, and easy to use drop-in rolls with built-in spools to ensure a simple change of rolls, the QL-800 Label Printer is the professional tool you need.